Paradoxa – Contemporary art from Japan – is the latest exhibition at Casa Cavazzini, Udine. The most representative contemporary artists from Japan are on show from the 17th april to the 28th of august. Manya Kato, Takahiro Iwasaki, Yuuki Matsumura, Taro Izumi e Taturo Atzu (alias Tatzu Nishi – author of the “site specific” work in Piazza Libertà). The works are dedicated to the concept of “Paradox”. Each work has been created just for Udine’s exhibition, few days before the exhibition opening with the active collaboration of the friulian companyCalligaris. Each work is connected with aspects of everyday life or our habits. The most common objects are subjected to distortion or discussed reaching a paradoxical situation. A useless slide, objects with a twisted usage, perspective variations, a negative sculpture, small artworks made of human hair and visible from a telescope only, a small living room, suspended around a statue on the top of a column, far away from the ground. This exhibition wants us to reflect, to stimulate our conscience and the aesthetic experience, because the paradox, the error, in oriental philosophies, can be helpful, expanding the ways and the shapes of our thought. 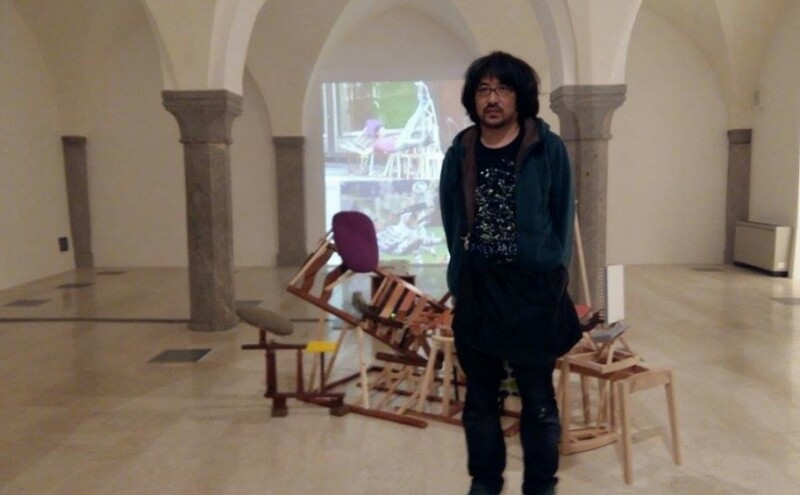 We were at the exhibition opening (find some pictures on Constraint Magazine Instagram page) and we managed to interview one of the five artists, Taro Izumi, who worked on the deconstruction of the Calligaris chairs. Taro Izumi, if I’m right this must be your first exhibition in Italy with other artists from Japan. How was the experience in Udine? How was the collaboration with the local company Calligaris? The collaboration with Calligaris has been very inspiring. I managed to use an experimental method transferring the artworks from my mind to the outside, in the Art World. I think that the process might be similar to the creation of a metropolis, created by people of different trades, with different goals and contradictions. The carpenter also had flexible ideas, I think that we communicated and had fun through the artwork. Now I am in Berlin and next to my apartment there’s a Calligaris shop. I feel like I’m still in Udine. I really liked Udine. I was born in Japan, in Nara, which is close to Kyoto, a very famous tourist spot. I found Udine similar to my birthplace, the fact that the city is close to a tourist city with a great history, Venice. The exhibition is based on the paradox theme. What is paradox to you and which paradox did you represent in your art work, here at Casa Cavazzini? When I’m creating my works I don’t have the control over the elements I’m using. I mix the freedom with the limit. I often obtain artworks that are different from how I am imagining them, but when the work is finished I think over and over about it. To me, the production of artwork is a paradox itself. The artwork “Tickled in a dream (maybe)” is inspired by the impossible pose of a football player ( the artwork, built from pieces of Calligaris chairs, is a support that allows to take the position of a football player). Is it a tribute to the Italian football passion? Do you share the passion for the game? I used the picture of the football player because of the shape of the position, more than the subject itself. It is hard to find such pictures in other sports, with so different movements. In football the players duck, stretch or jump, with a lot of variations and moves. Talking with Sai, my interpreter who plays football, I thought that I could make this work in Udine too. The strongest teams of the Japanese championship cannot be compared to a Serie A team. Making this artwork in Italy, the very place in which football is very popular, it seems to me, is relevant to Art. You have studied at the Tama Art University, and now you live and work in Tokyo. What does it mean to be an artist in Japan nowadays? Art in Japan is detached from society. We have to live feeling this friction with society every day. And even if this friction is perceived, the most serious thing is that a lot of Japanese people are not interested into contemporary art. I think that living in this situation has been a mental training to me. Udine has nothing to do with Tokyo, but is a small Italian city that is trying to be culturally active and it is slowly opening to internationality. How did you find it, culturally and artistically speaking? Would you get back for a further exhibition? In Udine I found the appropriate atmosphere to realize the artworks and to set cultural events. I like the way the people hang out chilling. Clearly it’s also nice to be frantic, as in Tokyo, but often the details are neglected. If another exhibition is going to happen in Udine I’d like to participate, but I’d also like to come back as a tourist. What are your next exhibitions? I’m in Berlin now, with the help of Mercedes Benz, I’ll present this works here and then in Japan at the Hara museum. This autumn I’ll be in Miami, and before the next summer I’ll be in Paris “Palais de Tokyo“,then, always in Paris at “GALERIE G.-P. & N. VALLOIS“, and then back in Japan at “Kanazawa 21st Century Museum“.